We have monthly trail runs scheduled through November with routes for both experienced drivers in modified rigs and new 4x4 drivers in stock rigs. Visit www.td4wheelers.com to expand your horizons and experience the High Sierra base camp that is our own Tahoe Donner! 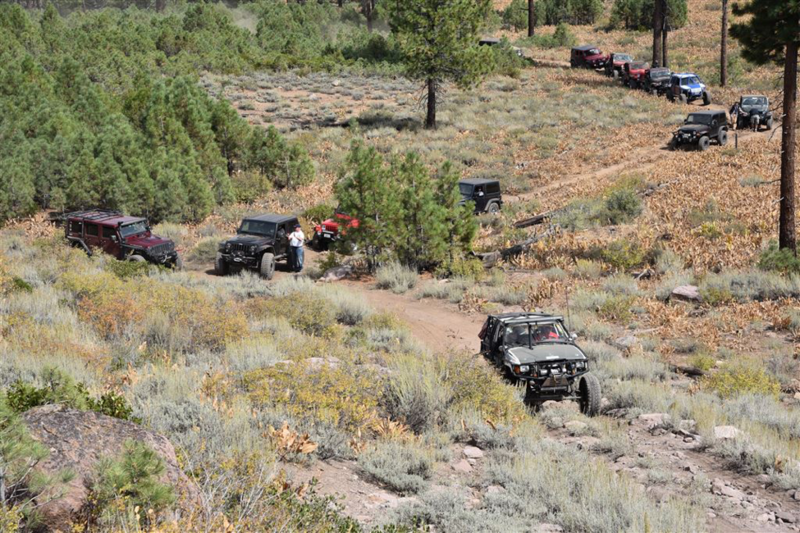 Over thirty vehicles and sixty participants had a blast exploring the Bear Valley Off-Highway Vehicle (OHV) route near Little Truckee Summit in the always scenic Tahoe National Forest. The OHV loop has three challenging hills including Uptown Hill, Ball Peen Hill and Winch Hill, as well as a rocky section called Downtown Pipe. All the major obstacles have by-passes available. With our capable spotters, everyone enjoyed the trail safely, from stock Jeeps to highly modified rigs. After the run we all returned to the Northwood’s Club House Event Tent for a Tahoe Donner Catering dinner of fall off the bone ribs, delicious chicken, baked beans, pasta salad, Caesar salad and to-die-for brownies – the food and the service was truly exceptional! Plus we had craft beer from Cool BeerWerks Brewery courtesy of members Rochelle and Steve Robello. All good stuff to enjoy with friends! Thanks to all our volunteers that made this event possible and to Tahoe Donner Catering for the great food! Club Members Don Schellenberg and Dean Anderson ventured out with friends to run the Rubicon Trail from Loon Lake to Homewood. Dean even towed a trailer! They made it the entire route including Little Sluice, Big Sluice and the infamous Cadillac Hill. It was a two nights, three days adventure! Per Don “There was very little time to relax at the wheel” as the obstacles come one after another. For the full story of their adventure, see the “News” section of our web site. Well done guys and congratulations!